I received another awesome VoxBox from Influenster a few weeks ago. Inside I received the Colgate Optic White Toothbrush + Whitening Pen, some toothpaste and quite a few coupons to repurchase the product. I’m always excited to try whitening products because I have a big smile and want the whitest smile I can get. The Colgate Optic White Toothbrush + Whitening Pen is an all-in-one solution that claims to go beyond surface stains to deeply whiten teeth. It is advertised to give you whiter teeth in just two days. It is marketed as an easy to use whitening product. You get a toothbrush and a whitening pen that contains a gel whitening solution. The whitening pen stores inside the handle of the toothbrush which is convenient. It doesn’t require a cap or anything, you just pop it into the handle of the toothbrush. I thought that it was a great idea. Brush your teeth with the tooth brush, they recommend using their Colgate Optic White Toothpaste. After brushing apply the whitening gel with the whitening pen and then you are done. I had no hopes whatsoever for the Colgate Optic White Toothbrush + Whitening Pen, it really seemed too good to be true. I do own professional whitening trays that I have used them once about a year ago. I wasn’t expecting this product to live up to my dentist prescribed whitening trays. I received a medium coarse toothbrush which I found to be harsh on my mouth. I did continue to use it so I could see the full effects of the product. The toothbrush has rubber scrubbers in the center that are suppose to help remove surface stains. My teeth did feel a lot cleaner and fresh after using the toothbrush. I would have preferred a soft bristle brush and will buy one with soft bristles when I repurchase. The toothbrush felt kind of cheap overall, so I decided I’d only continue to use it while using the whitening pen and then switch back to my normal tooth brush after. After brushing I applied the whitening gel using the pen. I thought that the pen made applying the gel easy and quick. I used two clicks for the top and two clicks for the bottom. I did one click at a time so I could spread it evenly and not over apply the product. I’ve used whitening products before and it is always messy when you apply to much. After applying the whitening gel the directions say you can just go. After reading reviews online people seem to be confused about what that means. No where on the directions does it tell you how long to wait till you can drink or eat or if you should close your mouth right away or what. I applied the gel to my bottom teeth, waited a minute or less and then applied it to my top teeth. That way I made sure the gel stuck to my teeth without washing away. After applying the gel I didn’t eat or drink until it had disappeared. One thing I do find strange about the whitening gel is that it just ‘soaks into your teeth’ and disappears. It concerns me that I am swallowing the gel and what it could do to my health if I used the product over a long period of time. Colgate says to continue using the pen twice a day until it is finished and then replacing the toothbrush with a new one every three months. I have developed sensitive teeth over the past year or two. I’m not sure why exactly, maybe from my whitening toothpaste, or maybe it has happened with age. I’m not affected by hot or cold, just by whitening products. I have always been a Crest toothpaste user and for the past few years have been using their 3D White Toothpaste. I had to start alternating with that in the morning and Sensodyne in the evening because it was too much for my mouth. Crest released a sensitive version of their 3D white toothpaste and I have been using that ever since. I haven’t had any sensitivity issues since using the sensitive version and have been able to use it both morning and night. When I whitened my teeth professionally with my whitening trays I experienced quite a bit of sensitivity on my gums and teeth. I couldn’t do it every day like I was told because it would cause me pain. A pain I’d never experienced before, it was like shooting pains through my teeth and gums. The Colgate Optic White Toothbrush + Whitening Pen hasn’t cause any sensitivity to my teeth or gums. Which is amazing! It isn’t near as strong as professional whitening so maybe that is why it doesn’t cause any sensitivity. It is pretty easy to just apply to your teeth to and avoid your gums so that also helps prevent sensitivity. If you have sensitive teeth this may be a whitening option for you. After the first time using the Colgate Optic White Toothbrush + Whitening Pen my teeth appeared whiter. Or so I believed, I always think my teeth look stained even though my dentist says their a whiter than average. I continued to use the toothbrush and whitening pen every morning and every night before bed and I did see a difference. My teeth appeared to get brighter every day. I was very impressed with the results and excited that it was such an easy process. I didn’t think that I would see any results from a whitening pen from the drugstore. I was wrong! I am still using this product and it has been about 10 days. I still have whitening gel left in my pen and am not sure how long it will last but will update you when I’m done. I am hoping that the results last and that my teeth stay white for quite some time. But we will see what happens. The results from my professional whitening has lasted quite awhile and I probably didn’t even really need to whiten my teeth. I noticed the Colgate Optic White Toothbrush + Whitening Pen at Walmart yesterday for $12.99 which I think is a very reasonable price. A toothbrush alone typically costs around $3 – $5 and with this product you get both a toothbrush and a whitening pen. I’m sure it costs more at other stores but I shop quite often at Walmart because I think they have the best prices. 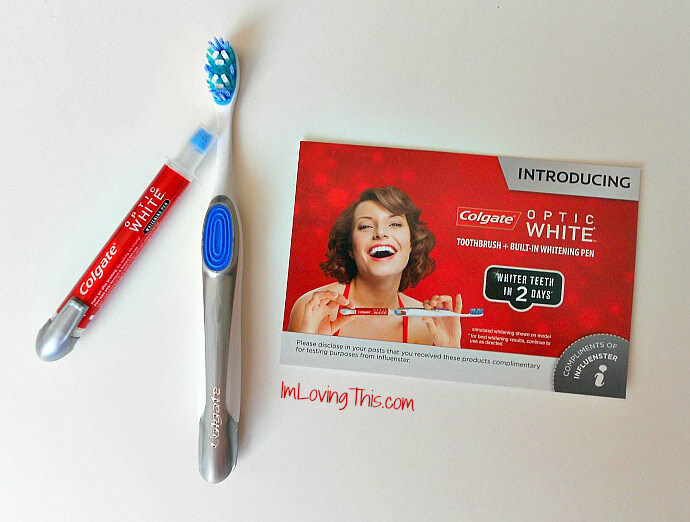 I do recommend that you try the Colgate Optic White Toothbrush + Whitening Pen if you are looking to whiten your teeth. It is a much cheaper alternative to white strips and professional whitening. Not to mention it is easy to use and you don’t have to sit there with a stupid tray or strip over your teeth for an hour. I would really like it if Colgate just sold the gel pen as is without the toothbrush. I am pretty particular to what toothbrushes I use so it would be nice to just have the whitening pen so I could use it with whatever toothbrush I wanted. Like I said previously, if you have sensitive teeth this could be an option for you to whiten your teeth. You may want to consult your dentist before using any whitening products as I am not a dentist myself and this is just my experience with the product. After using the whitening pen, how long should I wait until I eat or drink? Colgate says that you can eat right away. I just bought this product today and used it for the first time. Puzzling however, that nowhere on the package does it mention how long to wait before eating and drinking. It leaves one with the idea that he/she can just brush, apply and carry on normally.